Unfortunately, no leak is a small leak and what starts as a minor leak can lead to a huge problem. The tank in the video is a 200,000 gallon wood tank used for water storage and clearly the tank requires some significant work. At this point the tank needs to the replaced as soon as possible as it is not repairable. The tank is a key element of the facilities operations and therefore it is critical a replacement installed quickly. 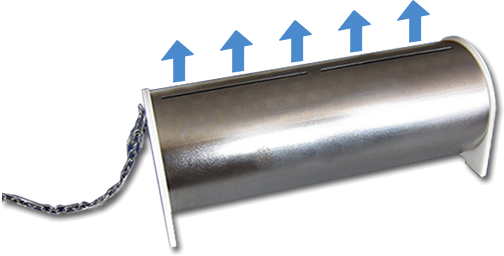 Superior Tank Solutions will be able to provide a new bolted steel tank in record time to minimize the time the out of service duration. 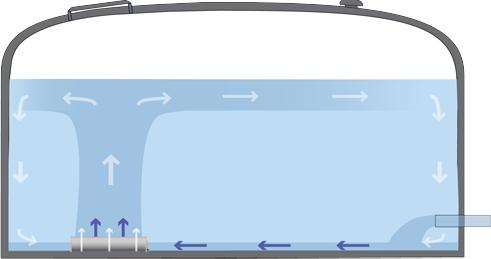 The leaking tank can remain in service temporarily until the new bolted steel tank can be manufactured at the factory then shipped to the location. A bolted steel tank of this size could be erected in place of the failing tank in under a week with very little interruption to the facility. 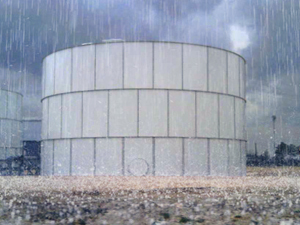 Unlike temporary storage tanks, a bolted steel tank provides a permanent and long term solution. See a bolted steel tank being manufactured then installed…. Superior Tank Solutions offers low cost tank conditional inspections, repairs and replacements. To help smaller water districts purchase water storage tanks, Superior Tank Solutions recently introduced a steel tank leasing program. Community service districts, municipal utilities, water districts and end users can now lease our bolted steel storage tanks for 24 to 60 months at attractive rates. Our leasing program allows buyers to spread payments out over time and conserve cash. Lease payments are funded via revenue from operations instead of using scarce capital funds. Storage tank ownership is seamlessly passed to the buyer at the end of the lease term. Rates and terms for the tank lease will vary depending on the credit of the tank purchaser and project details. In addition, one funding source will be considerably more competitive than others based on the specifications of the project and our dedicated leasing agent works with various funding sources and customizes packages to needs of the buyer. Our tanks are bundled together for higher volumes ensuring our customers are getting the most advantageous terms. A wide range of bolted steel storage tanks from Superior Tank can be leased ranging from 10,000 to 3,500,000 gallons. Many types of bolted steel tanks including tanks used for storage of potable water, water for fire protection, rain water harvesting and wastewater can be funded via the leasing program. The erection cost as well as the purchase price of the tank can be included in the lease. For details on our tank leasing program and a price estimate, we recommend speaking with our leasing specialist.